We have investigated and the cell which this user is connected to experiences high utilisation during busy periods. This means that the speed of this service is likely to be reduced, particularly in the evening when more people are using the internet. This site is scheduled for capacity expansion in Quarter 4, 2017 which should result in improved performance for users on the site. While we endeavour to upgrade sites on their scheduled date, it is possible for the date to change. I wasn’t especially happy with that reply after a support experience that lasted for a month, but some time in October that year, the evening packet loss became less, and the window of time where we experienced congestion shrank. So I guess they did do some sort of capacity expansion. It’s been mostly the same since then, i.e. slower in the evenings than during the day, but, well, it could be worse than it is. 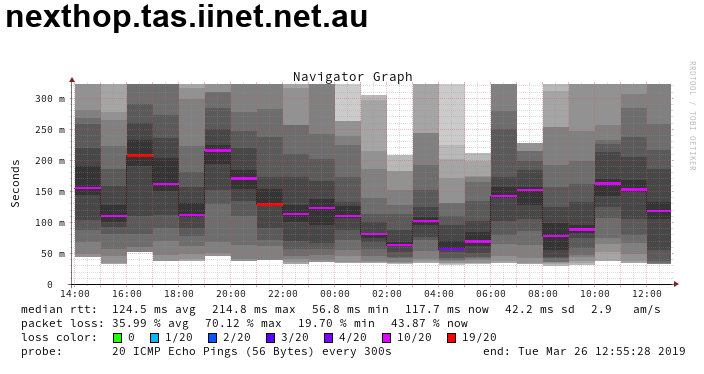 There was one glitch in November or December 2018 (poor speed / connection issues again, but this time during the day) which resulted in iiNet sending out a new router, but I don’t have a record of this, because it was a couple of hours of phone support that for some reason never appeared in the list of tickets in the iiNet toolbox, and even if it had, once a ticket is closed, it’s impossible to click it to view the details of what actually happened. It’s just a subject line, status and last modified date. Fast forward to Monday March 25 2019 – a day with a severe weather warning for damaging winds – and I woke up to 34% packet loss, ping times all over the place (32-494ms), continual disconnections from IRC and a complete inability to use a VPN connection I need for work. I did the power-cycle-everything dance to no avail. I contemplated a phone call to support, then tethered my laptop to my phone instead in order to get a decent connection, and decided to wait it out, confident that the issue had already been reported by someone else after chatting to my neighbour. Tuesday morning it was still horribly broken, so I unplugged the router from the NTD, plugged a laptop straight in, and started running ping, traceroute and speed tests. Having done that I called support and went through the whole story (massive packet loss, unusable connection). They asked me to run speed tests again, almost all of which failed immediately with a latency error. The one that did complete showed about 8Mbps down, compared to the usual ~20Mbps during the day. So iiNet lodged a fault, and said there was an appointment available on Thursday for someone to come out. I said fine, thank you, and plugged the router back in to the NTD. Curiously, very shortly after this, everything suddenly went back to normal. If I was a deeply suspicious person, I’d imagine that because I’d just given the MAC address of my router to support, this enabled someone to reset something that was broken at the other end, and fix my connection. But nobody ever told me that anything like this happened; instead I received a phone call the next day to say that the “speed issue” I had reported was just regular congestion and that the tower was scheduled for an upgrade later in the year. I thanked them for the call, then pointed out that the symptoms of this particular issue were completely different to regular congestion and that I was sure that something had actually been broken, but I was left with the impression that this particular feedback would be summarily ignored. I’m still convinced something was broken, and got fixed. I’d be utterly unsurprised if there had been some problem with the tower on the Sunday night, given the strong winds, and it took ’til mid-Tuesday to get it sorted. But we’ll never know, because NBN Co don’t publish information about congestion, scheduled upgrades, faults and outages anywhere the general public can see it. I’m not even sure they make this information consistently available to retail ISPs. My neighbour, who’s with a different ISP, sent me a notice that says there’ll be maintenance/upgrades occurring on April 18, then again from April 23-25. There’s nothing about this on iiNet’s status page when I enter my address. There was one time in the past few years though, when there was an outage that impacted me, and it was listed on iiNet’s status page. It said “customers in the area of Herringback may be affected”. I initially didn’t realise that meant me, as I’d never heard for a suburb, region, or area called Herringback. Turns out it’s the name of the mountain our NBN tower is on. This entry was posted in Uncategorized and tagged nbn, tasmania, telework by Tim. Bookmark the permalink.